An ongoing project of mine has been to create a documentary about a hot dog joint near and dear to my heart, Casey's Diner in Natick, MA. This is over and above anything related to the National Hot Dog Month Tour. You see, Casey's is one of those places that are disappearing from the American landscape. Small, family owned diners like this used to be in every community, now they have succumbed to the "mallification" our country. They are more than mere "museum pieces," they are a connection to a past that was simpler, more wholesome and welcoming in retrospect, and had much more soul and personality. Casey's is also the oldest family run diner, continuously run by the same family, in the USA. 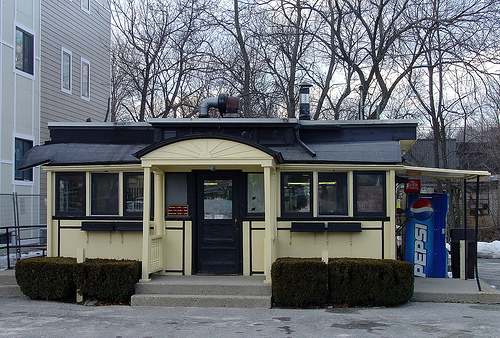 The Casey family has been serving hot dogs to the citizens of Natick since 1890. That in itself is not only an achievement, but a testimony to the enduring nature of small business, entrepreneurship, family values, and community that make this nation so great. Today, Drew Bennet, from the Benspark Blog, and I went to visit Casey's before they opened. Drew and I are collaborating on this project. 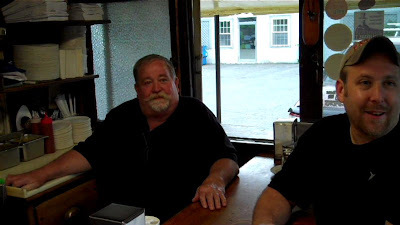 We chatted with Fred Casey, third generation owner, who comes in every morning to do the prep work and his son Pat, the fourth generation (and Hot Dog Stories Star). We spent about an hour and a half shooting video and taking pictures, while getting Fred's insight into the Casey's story. Drew and I will finish the National Hot Dog Month Tour at Casey's Diner on July 31. We will begin work on the Casey's Documentary and the National Hot Dog Month Documentary the very next day!